Contributions are welcomed on any subject which will interest our members around the world. 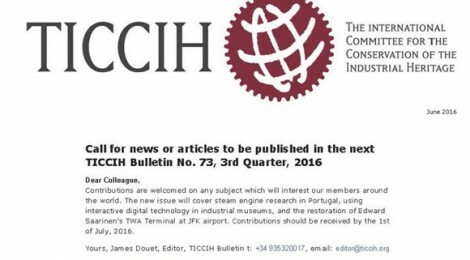 The new issue will cover steam engine research in Portugal, using interactive digital technology in industrial museums, and the restoration of Edward Saarinen’s TWA Terminal at JFK airport. Contributions should be received by the 1st of July, 2016. 2016 TICCIH membership dues are now overdue if you have not already renewed. Please renew for 2016 as soon as possible if you wish to continue to receive the TICCIH Bulletins. You can check the TICCIH online directory to see your current dues payment year. Join or renew TICCIH membership for 2016 online.